Traditional Korean fare meets modern flavors and styling. 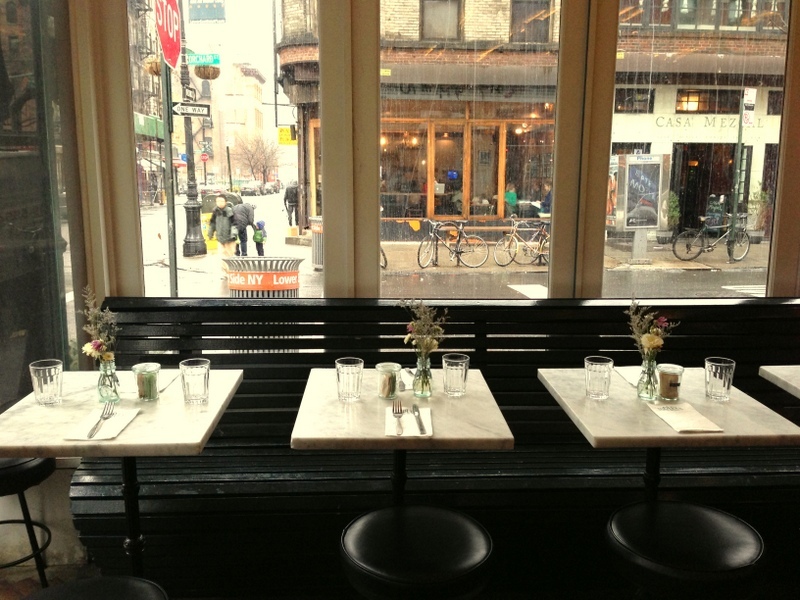 A Gluten-Free Menu meets a Brooklyn Pop Up. Acclaimed Seoul Chef Wonil Lee meets Seoul in the City’s Sarah Lee. This collaboration promises an innovative, beautiful, and flavorful dining experience. Don’t miss out on this truly unique interpretation of Korean cuisine! There will be 3 seatings, 20 seats/per seating. Dinner 1st seating-5:30-7:30pm ($45/person)-SOLD OUT!!! Dinner 2nd seating-8:30-11pm ($45/person)-SOLD OUT!!! The quote above pretty much sums up my life vision…my everyday vision. Some of you may remember my previous posts about my farm experiences: Blue Hill at Stone Barns, Bean Table, salt farms in Korea, and visiting any farm for that matter. So today I'll be sharing about the Hudson River Valley. My sweet addiction: shaved milk+fresh house made red bean paste+house made rice cakes. Okrumong 오루몽 was among some my favorites. So my favorite part of this trip was the red bean bingsoo. There were some amazing things that I tried for the first time, or new discoveries. However, the *winner* was definitely this dessert. I think I ate it uh...every week? haha. This explains the extra kilos my body picked up along the way. The most eye opening experience that I had recently was a 2-day road trip in South Korea's beautiful Jeollanam-do (절라남도) province towards the tail end of my trip this month. What I have learned, tasted, uncovered, and felt was truly an experience that stands alone. Through this journey, I hope to be more truthful in my work and in what I share moving forward. This was the first time visiting Korea's salt farms, and what I have discovered was both beautiful and sad. What I'm about to share may come to a shock to most of you. Perhaps this story will encourage you to rethink about the salt we intake, especially if you reside in Korea. If it doesn't, I have no other comments. This story really, really hit home for me. Kim Mak-dong (김막동) has been farming salt for over 40 years in Hae-nam, Jeollanam-do province (해남 절라남도). What encouraged him to start clay farming was a visit from a Buddhist monk early on during his career, which recognized that his salt farm is located in very special grounds near the South Sea (which is bounded by the southwestern part of the Sea of Japan, and by the southeastern part of the Yellow Sea). Just to give you a brief description of how sea salt is formed: the sun evaporates the dilute seawater brine. In general, there are 3 main methods used to produce salt: solar, evaporation, & rock mining. For the evaporation process, it takes 7-10 consecutive sunny days to produce sea salt. Thanks to Sarah Lambersky & staff at Countlan Magazine for the recent feature on my Korean Salted Mackerel Recipe! Countlan based in Denmark, is a quarterly online magazine that explores how people entertain at home all over the world. Captured with gorgeous photos, Countlan really helps you see the beauty of individual stories through their lens. As most of you know, I moved to New York early January of this year. After temporary residency at my friends place, to staying with family when I first arrived, I finally settled in my own home in Prospect Park Brooklyn just a few months ago. I was caught up with a busy schedule when I first moved in for months, but now finally exploring my neighborhood. I'm thrlled to have a kitchen space where I can test recipes again, and throw random dinner parties + just going to the park to have picnis with friends. Yes, this is why I am here. This is why I need to be here. Prospect Park. My new home. So I have some extra time on my hands at the moment, and will be taking advantage of 'Sarah's Holiday+Food Research' to a different level. Time to get my hands dirty again in the kitchen, outside, and at restaurants...seriously. I was recently interviewed by Muriel Amable, writer for Singapore's Food and Travel Magazinefor their April 2013 issue. They picked my brain on my favorite eats in Seoul for their readers...these places bring back such sweet memories, and I cannot wait to visit real soon! I’ve been in New York for close to 3 months now. I can’t love the food enough, and the hustle & bustle really puts you in your place. How can you not love this city? However, as much as I’m an urban girl and love to be out and about…the times that I thoroughly enjoy the most is when I get a moment to breathe. You’ll hear many New Yorkers say they like to leave the city for a quick weekend trip, just to get away from the madness. It didn’t occur to me that I desired to partake in this as well. Something that most people may not know about me is that my ultimate dream is to have a small farm of my own. A girl from Chicago, who loved living in Seoul, love city lights, and now a member of the daily grind in New York is still planning on making this dream happen. So when I stepped foot into Blue Hill, I instantly felt a connection. Almost like I was home. I seriously didn’t want to leave. Words are limitless to describe my recent experience at Blue Hill at Stone Barns. A few of my co-workers introduced me to this place on our drive back to the city, after some long meetings in Connecticut late January. Ok folks, this post is simply a teaser. Not a 'full' post featuring one particular restaurant of any kind, but wanted to share some photos of oh maybe 40% of what I've eaten so far in a month? Yes, I've went up a size in pants I think (thank goodness for leggings! ), can feel the double chin forming, and having a hard time zipping up my winter coat. Let me tell you, even with all the walking that I do here in NY, I think I need to add another form of exercise to maintain my eating habits, haha. No joke. Well, a girls gotta do her 'due diligence' with food research right? "Open your eyes…there's no time to waste anymore. The answer is right in front of you." Summer of 2006, I caught up with my ex-college roommate Paula, and had a quick chat about food. Paula gave me the lowdown about her sister Beverly, and mentioned that she was in Seoul for a few months. So what do I do? The usual crazy Sarah move. Called up Beverly in Seoul (please note that I have I only seen her once before at this point, and we barely knew each other), and asked her if she would like to possibly partner up with me on a restaurant project in Chicago! When I travel, I act like I've never traveled before. I know this sounds funny, but every other day whether I'm working or hanging with friends, I plan plan plan...organize, try to be on top of things, and sometimes wear the 'know it all, everything is under control' hat, haha. Then you hand me a suitcase and a plane ticket, throw a map of whichever city, I have this blank face and seriously start breaking sweats...especially if I'm traveling alone. Hong Kong was one of those cities. Friends, family, and readers-I have left Korea recently to pursue some amazing opportunites in the U.S. Although I have left the country that I dearly love, I hope that all of you will continue this food journey with me as I eat my way around the U.S. and other countries. My experience in Seoul cannot be put into words, and the memories and stories will always remain with me. Thank you, thank you, thank you for walking with me all these years!